Chester Aaron's novel-in-stories, About Us, published nearly 35 years ago, holds a unique and lasting place in the artistic annals of American boyhood. Through the account of young Benny Kahn we come to inhabit the Pennsylvania mining town of Sundown in the years leading up to World War II. Colorful and clear-eyed, unsentimental but full of feeling, the book gives us a rich and textured sense of life as it was lived there and then. Now, in About Them, an octogenarian Benny revisits what remains of that largely vanished world--to show what time and memory have done to the characters and the place, to fill in suppressed pieces of the past, and to irradiate the whole with a sense not only of what was and is, but what should be. The narrative, by turns dramatic, comic, and chilling like its predecessor, is nonetheless permeated with kindness, generosity, and love right up to the astonishing ending. How Aaron manages this without a trace of mawkishness is not the least of the truly rare delights this book offers. This is an amazing book. It quietly and honestly reveals an underbelly of American life that is simultaneously terribly naive and terribly cruel. Set in a place that Chester Aaron knows by heart, it uncovers a part of America--and a place in America--that seems now almost prehistoric through a range of characters that are perfectly drawn, if unbearably so. You won't quickly forget this book. A magnificent blend of past and present, that will move you to tears and also leave you feeling joy. The French, of course, have a word for it: Joie de vivre � this book is the living embodiment of joie de vivre. This is a wonderfully passionate book about a cast of passionate characters by a passionate author. Not to be missed. I love the way Aaron writes, how he puts words together. Like a good painting. The painter must make the viewer want to �look� and then engage them with the content. As the author's narrator reminisces about his past it causes the reader to bring their own past stories forward. His battles with discrimination, coming of age and missed relationships are our stories. By Ben and Early making right after years of separation, the novel brings us face to face with the redemptive powers of love and forgiveness. ABOUT THEM is a travel through time. Our time. Forty years after About Us, Chester Aaron's classic novel, about the sole Jewish family in the mining town of Sundown, Pennsylvania, Aaron has returned to the scene with a rich, poignant novel that demonstrates that time can actually make us wiser. 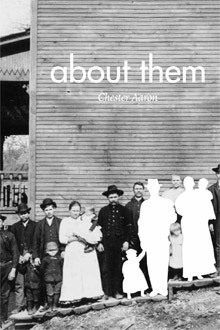 In About Them, Chester Aaron deftly weaves the past into the present with a crisp, intriguing story of race relationships in a small coal mine town in Pennsylvania in the 1930's and life in present-day northern-California. The book will make you laugh, cry, and feel every emotion in between. Sequel --and superior--to his original award-wining masterpiece, About Us. —Robert Kourik, author of Roots Demystified. About Them takes the reader on an exhilarating journey from the depths of human tragedy to enduring love and joy. Chester Aaron's much anticipated sequel to About Us adds to the collection of unforgettable characters that shape American Literature. Bravo, Mr. Aaron. From the hollers of southwestern Pennsylvania to the hills of San Francisco, Chester Aaron maps a world at once terrifying, humorous, and inspirational. Whether about "them" or anyone, his tales are always about all of us. I read Chester Aaron�s About Us when I was 14 years old, and I have never forgotten it. Now, some 43 years later, Mr. Aaron has brought us About Them�and it has landed on earth ever so gently, like a gift from heaven. In its interweaving of a heart-tugging past with a bittersweet yet optimistic present, it is so much more than a sequel; it�s a satisfying, enriching portrait of a community�Jewish and gentile, black and white�that has, over the course of 80 years or so, engaged in personal and political battles both large and small, and somehow emerged with its dignity intact and�finally�come to terms with itself. In this novel�s detailed description of people and place, as an exploration of a past that is no more, and as a seamless blend of fact and fiction, About Them easily stands alongside its progenitor as one of the most moving novels of this or any other year. Chester Aaron has done it again, with "About Them", written a magical memoir-novel, with his original voice like no other, so fine-tuned, the reader has no choice but to become his companion, growing up, looking back, forward, putting memory to its most stunning use - a delicious brew of family, community, world history, the black, white, Christian, Jew of it all, in the U.S. mining town where he grew, matured, left to become a famed teacher, artist, and exquisite observer of life. Soldier, X-ray technician, garlic farmer, author�in his 88 years on Earth, the multifaceted Chester Aaron has nearly done it all and lived to write the tale. The author of 26 books, Aaron's latest novel, About Them (El Leon Literary Arts), revisits the "largely vanished" world of his very first book, About Us, an autobiographical exploration of a 1930s Pennsylvania coal-mining village. "My stories are about 50 percent fact and 50 percent fiction," says Aaron, by phone from his home in Occidental. He was inspired to write a sequel to About Us, he says, after a visit to his hometown revealed an unexcavated side to the original narrative involving the love between a Jewish boy and an African-American girl. "I doubt I will write anymore about that place or those people," Aaron says. "Writing brought them back in body and soul. I miss them now more than I did when I started." Born in 1923 in a Pennsylvania coal-mining town, Chester Aaron served in World War II. After attending UCLA, UC Berkeley, and San Francisco State, he joined the faculty of Saint Mary's College, retiring in 1997. Author of novels, stories, and memoirs, he is known world-wide as an expert on garlic, growing more than fifty kinds on his farm in Sonoma County.